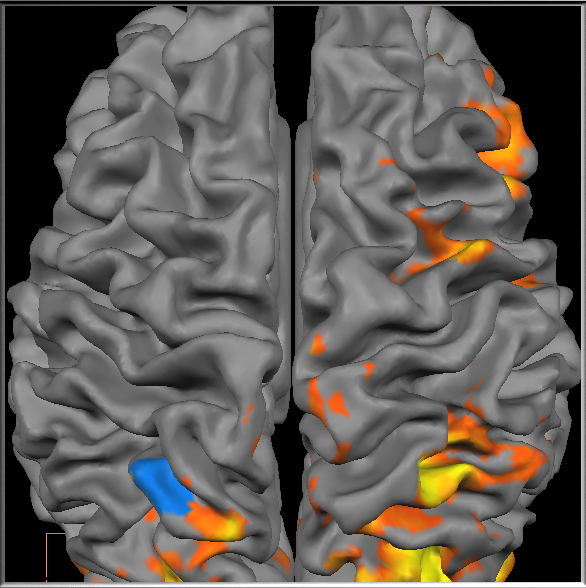 This view allows to visualize contrast maps on surface-rendered 3D models of the cortex (see snapshot below). The cortex meshes may be rotated and zoomed providing both useful overviews as well as detailed views on the brain. The meshes must reside in the same space (e.g., intra-session, AC-PC, Talairach) as the 3D data set shown in the Anatomical Volume View. The surface meshes must be prepared before the functional measurements using BrainVoyager QX and specified in the TBV Settings Dialog, for details, see section Prepare Advanced Visualizations. To switch to Surface View, click one of the two Surface View Icons (see snapshot above) or press the S button. Both icons will be enabled if two meshes are specified in the TBV Settings Dialog, typically one mesh for the left and one for the right hemisphere. If only one mesh is specified, only the left icon is enabled. If two meshes are available, you may show or hide one of the two meshes by pressing the Left or Right Hemisphere Surface View Icon. You may navigate in Surface View by using the mouse or keyboard. Moving the mouse cursor up / down while holding down the left mouse button will translate the viewpoint. If in addition the SHIFT key is pressed down, the mesh can be rotated and if both the SHIFT and the CTRL key are down, the viewpoint moves towards or away the meshes (zooming). The position of the selected mesh vertex is transformed back into a position within the original slice data using a spatial transformation linking the two spaces. Using the current spatial transformation, the positions of the determined ROI voxels are transformed "forward" to mark corresponding vertices on the mesh in the color of the respective ROI. In a similar way, ROIs are also marked in all other visualizations using the same definition in the original slice data.